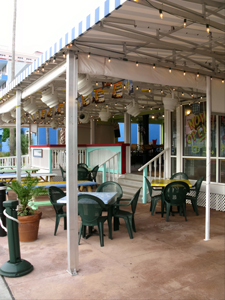 Crabbys Bar and Grill on Clearwater Beach FL has great food and the best view on the beach. At Crabbys Beach Bar you can relax, listen to live music, and enjoy the panorama of stretching out below. Located on The Beachwalk, about a hundred yards south of Britt's Laguna Grill , Crabby's is quickly becoming a favorite for both visitors and residents of the Gulf Coast barrier islands. It advertises itself as having "The Best View on the Beach" and it would be hard to argue with that boast. 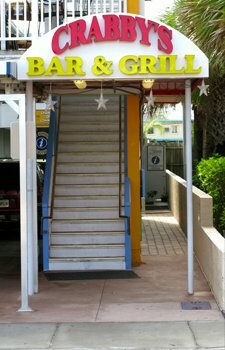 Although there is outside seating beside the Beachwalk, it is easy to understand why everyone wants to eat on the 2nd level. You get a great view north and south along Gulfview Blvd, plus the Gulf of Mexico along Clearwater Beach . We came here prior to heading down to Pier 60 to see the jugglers, artists, and street musicians. Crabby's is perfect for viewing a Florida beach sunset before you start your evening. Crabby's clean exterior, simple decor, and friendly hostesses validate the perception that this could be a cool place to checkout. Passer bys, both pedestrian traffic and people in cars are easily drawn to this little place. As you can see, there is spacious outdoor seating downstairs, but most people like to sit on the second floor where there is a full bar with both patio and inside seating. Fresh seafood is the mainstay of the menu, but there is plenty of other appetizers and entrees for those who like something different. There is live music Friday - Sunday evenings. 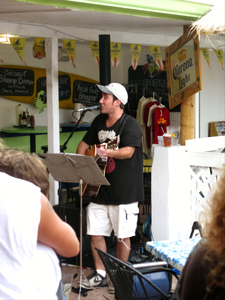 When we were there on a Saturday, Todd Lutz played guitar and entertained the crowd with some great one-liners and his own renditions of popular songs. 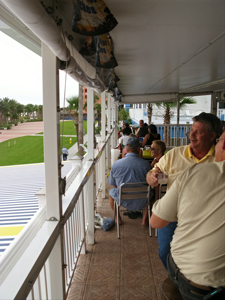 Customers can relax at either the bar or on the patio deck for a great view of Clearwater Beach. At the other end of the bar, live entertainment takes place. Do you need to worry about stingray season on Clearwater Beach?